Gujarat Gaun Seva Pasandgi Mandal (GSSSB) Female Health Worker (FHW) Provisional Answer Key Declared (24-09-2017), You Can Download From Below Given Link For Check And Solve You Given Paper And Check Your Marks. 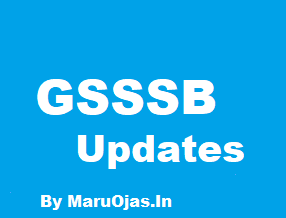 About GSSSB: The General Administration Department of Gujarat Government was constituted to provide the tasks set out in the Resolution No: 1-3-88 of KG-1186- 1615-G3 to “Staff Selection Commission”. For the purpose of making the name of this Commission, its performance, field of field affairs, in order to make it more transparent, it is proposed to keep its “Gujarat employee 5 Sansaghi Mandal” by the Resolution. No: KVY-1186-1615-G.3 of the TA-11-1988 section of the society. It was 5 but in the state, the Commission called the Gujarat Public Service Commission, could not have two compositions for the same purpose, so in the resolution of 01/05/1990 dated Sa.V. section. K.B.Y.Y.-1088-Rari41-G3 has been named as “GujaratSecondary Service 5 Sansagiri Mandal”. This office has the office’s head office status.